Hangouts has also connected Mashable employees with each other. With their headquarters in New York City and editors scattered across the U.S. and Europe, Mashable now uses Hangouts as a virtual meeting tool. The screenshare feature even helps Meghan train remote staffers who can follow along with her presentations. Add Google+ plugins When Mashable added the Google+ badge to their homepage, they increased their Google+ page audience by 38 percent. 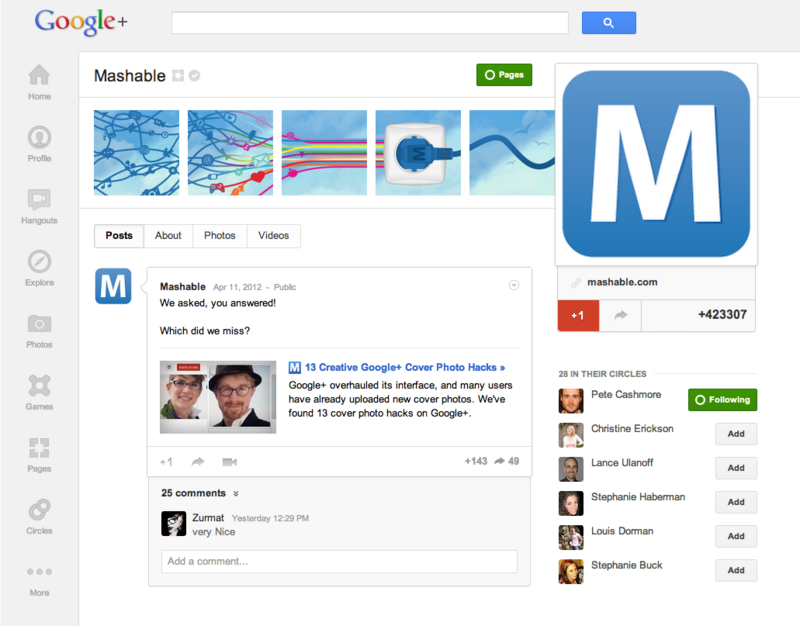 Mashable also uses the +1 button on articles and across the site to empower sharing to Google+. Follow Mashable on Google+ and download the full case study here. Mashable is an independent news site devoted to digital culture and technology and was one of the first publishers to join Google+. Since joining, Mashable has been building their audience on the platform, growing Google+ into one of their top 10 sources of referral traffic. We chatted with Mashable’s Community Manager, Meghan Peters, about their first few months on Google+ and what’s made them so successful.